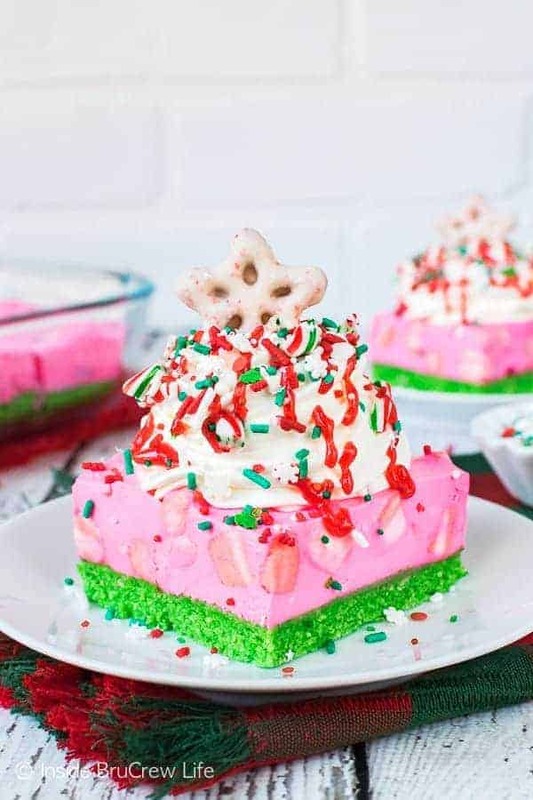 Bright colors and lots of sprinkles make these easy No Bake Peppermint Cheesecake Bars stand out on your Christmas dessert table. The bright colors make it the perfect dessert for all the elves in your life. So, I did something scary last night. My husband and I did a live post on my Facebook page. Honestly, I thought I would be more nervous as it got closer to our start time, but it wasn’t until right before he pushed the play button that I forgot everything I wanted to say. The video started sideways, so it totally made me more relaxed because that’s just life. Nothing is perfect, and you just have to roll with it, right? 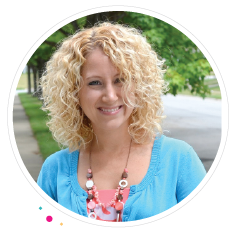 We shared some family holiday traditions and then answered some questions about blogging and baking. It was so easy and fun, that we are planning on doing more in the upcoming year. Does that sound good to you? This fun, bright, colored, crazy cheesecake is another thing I just had to roll with. 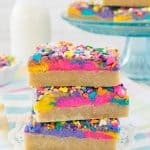 Earlier this year I made these fun no bake rainbow unicorn cheesecake bars, and everyone has gone nuts for them. The original video got a lot of views, and the pictures have been pinned tons of times on Pinterest. Well, that got me thinking. 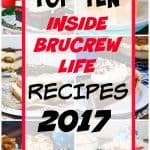 How could I turn those fun cheesecake bars into a holiday treat? 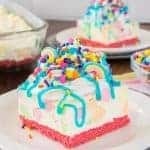 Since the unicorn bars have lots of colored marshmallows inside it, I had to find a bag of peppermint marshmallows for the filling because I love the texture that softened marshmallows add to this dessert. I checked two of our local grocery stores, but neither one had the marshmallows I was looking for. Thank goodness for Target. You saved me once again by having bags of peppermint marshmallows in your holiday department. Of course, then I promptly put a few other things in my cart. Why can’t I go into Target for one thing?!?!?!?! 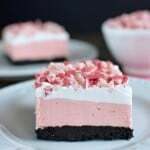 My original thought for this dessert was to make a chocolate crust like in this peppermint Oreo cheesecake, but I really liked the taste and texture of the wafer cookies in the unicorn cheesecake. So, vanilla wafers it is. 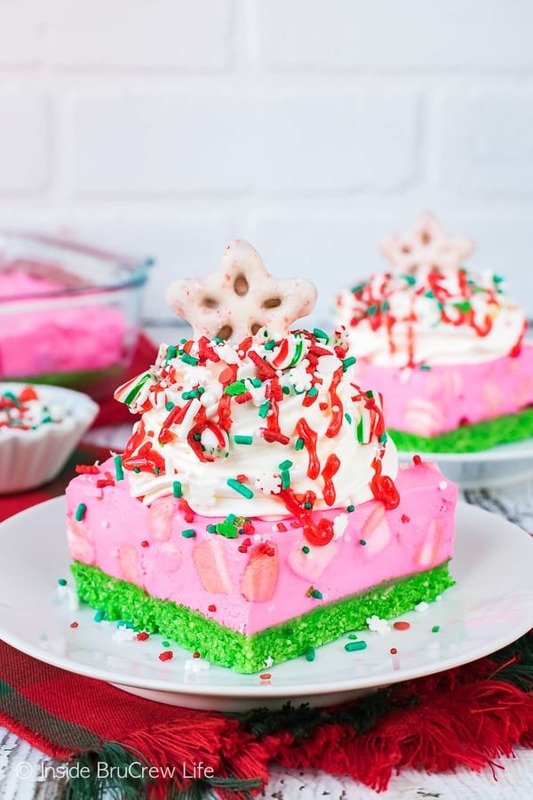 Bright colors and lots of sprinkles turn these crazy no bake peppermint cheesecake bars into a fun Christmas dessert. 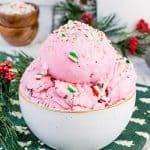 I couldn’t get the thought of a wild and crazy holiday dessert out of my head. You see the first thing I envisioned was a pretty pink cheesecake on a light vanilla crust, but then things just got crazy. There are jars and jars of sprinkles in our pantry, so I started pulling out different ones that I could use. As soon as I started mixing sprinkles, I realized a pastel cheesecake just wasn’t going to cut it. This needed some bright, fun, wild, and crazy colors to go with the sprinkles I had picked out. I added some green gel color to the cookie crumbs to give it a fun colored crust. Then I amped up the pink filling. Apparently, I had these candy cane pudding parfaits on my mind. My plan was for a light bright pink, but I didn’t expect it to be this pink. 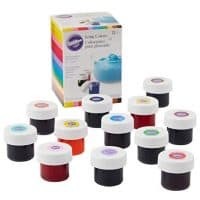 Word of warning…add your colors in tiny little batches. You can always add more it it isn’t the color you were wanting at first. I had a little too much pink gel on my knife, so it turned out pepto pink! At that point, I just had to go with it. After all, the crust was bright green, so why not have a hot pink cheesecake on top? This is one cheesecake that will stand out at holiday parties. Trust me! I love the layers of color in this Christmas Lasagna Dessert from Dinners, Dishes, and Desserts. 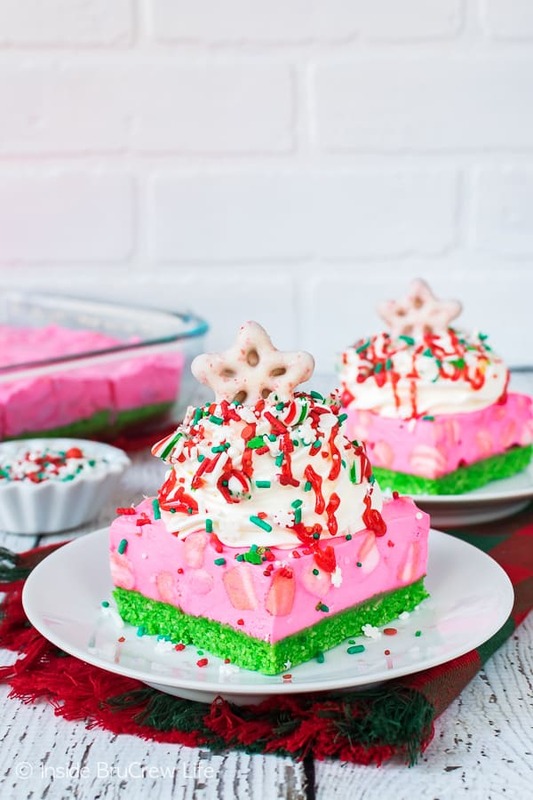 How fun are these Easy Christmas Tree Rice Krispie Treats from Rachel Cooks? 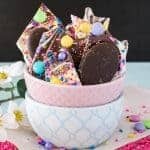 Pass me all the apples, cookies, and pretzels because I want to dive into this Red Velvet Oreo Cookie Dip from Wishes & Dishes. 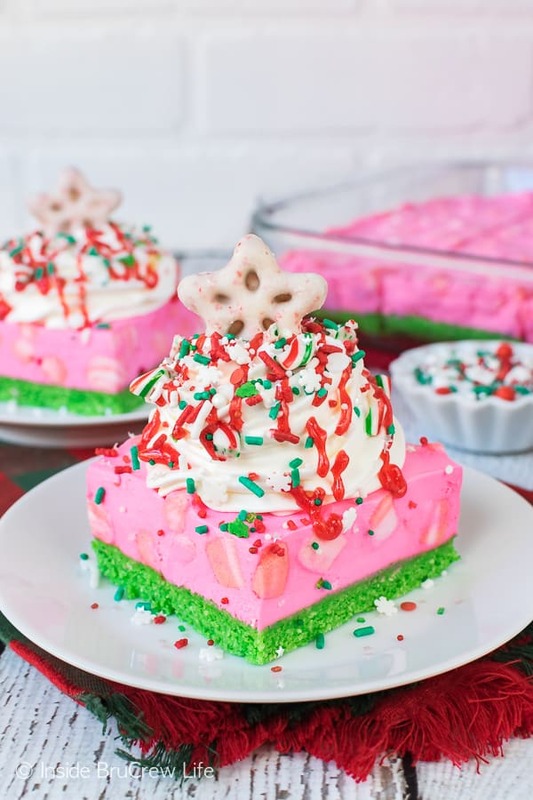 Bright colors and lots of sprinkles make these easy No Bake Peppermint Cheesecake Bars stand out on your Christmas dessert table. The bright colors make it a perfect dessert for holiday Elf parties too. Crush enough wafer cookies to equal 4 cups of crumbs. 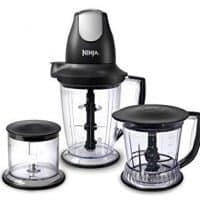 You will use one whole package and part of another. Mix the crumbs with the butter and mix completely. Stir in green gel color until you get your desired color. Press the crumbs evenly into the bottom of the prepared pan. Refrigerate. Beat the cream cheese until creamy. Add the sugar, extracts, and cream and beat again until creamy. 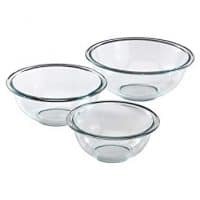 Fold in 4 cups of Cool Whip gently. Add pink gel color until you get your desired color. Stir in the marshmallows. Spread the mixture on the prepared crust. Refrigerate for a few hours. Cut the cheesecake into 24 squares. Top with the remaining Cool Whip, frosting, sprinkles, and candy canes right before serving. 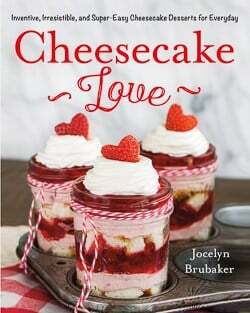 Store the cheesecake in a tightly sealed container in the refrigerator. Where did you get the stars at? I found them at the grocery store, but I have seen them at Walmart too!